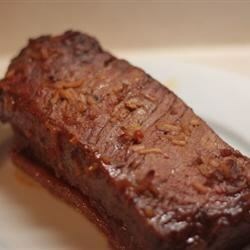 "Easy and delicious brisket recipe for Hanukkah or any occasion!" Mix together the ketchup, ginger ale, dry onion soup mix, brown sugar, and red wine in a bowl, and stir until the brown sugar dissolves. Place the brisket into a disposable aluminum pan, and pour sauce over the brisket. Seal the pan with a cover of aluminum foil. Bake in the preheated oven until the meat is very tender, about 4 hours. Tip: Make the brisket ahead of time, and chill in refrigerator. Slice the meat when cold, and put it back into the sauce for later reheating. this is so good and easy. great flavor. Excellent. Added an onion and a few cloves of garlic. Gone in a day. Great recipe! I'm so glad I "risked it"! The only thing I added was about a tablespoon of minced garlic and I also marinated over night. Awesome! Fabulous! Shredded cooked brisket with my Blendtec and it turned out perfectly. Made it exactly the way it said.. it was okay, not by favorite dish tho..
Great recipe! Brisket is pricy at $9 a pound but we got four dinners out of it.